A Montreal entertainment landmark that has hosted superstars such as U2, The Police and Peter Gabriel is on its last legs. 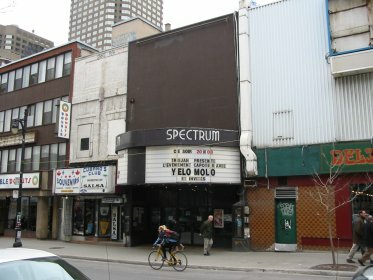 The Spectrum club on Ste. Catherine street will be demolished to make way for an office tower. Relocation plans fell through. The developer says negotiations to relocate the Spectrum to another part of the lot fell through. If the city gives the go-ahead, the Spectrum and several businesses next door will be demolished by summertime. For a story in French on this, go toCyber Presse. Also, see Drive-in’s pictures for this theatre.